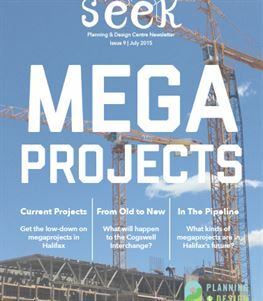 The ninth issue of Seek explores the past, present and future of mega projects in Halifax. The past couple of years have been big for Halifax-in more ways than one. The city has seen its fair share of new developments, there are gargantuan construction pits and cranes that are as tall as the pits are deep. These construction sites represent a change in the urban fabric, and thereby, a shift in the image of the city.